Your wish is our command! 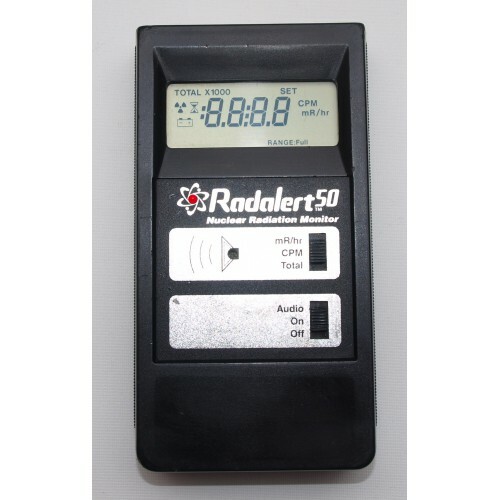 In response to popular demand we have acquired another small stock of Medcom's Radalert 50, one of the all time great pocket Geiger Counters/dose rate monitors. These superbly made instruments are rarely seen outside of the US where they were made; nevertheless, they have earned a well - deserved reputation for reliability and performance. The headline feature is Alpha, Beta, Gamma & X-Ray sensitivity. Yes, that’s right, Alpha sensitivity! 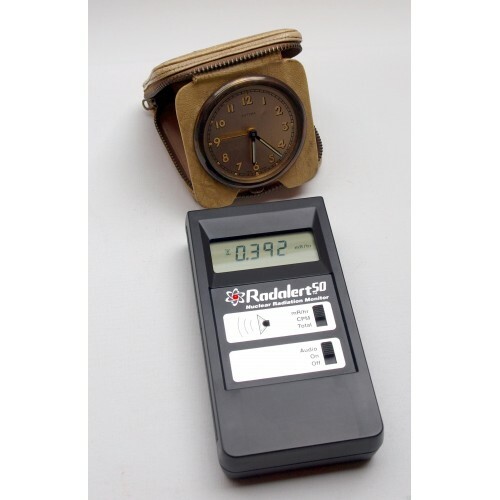 It is the hardest form of radioactivity to detect due to its very low penetrative power and this is all thanks to its remarkable LND 712 Geiger Müller detector tube. This has a thin mica end-window which allows Alpha particles to pass through. 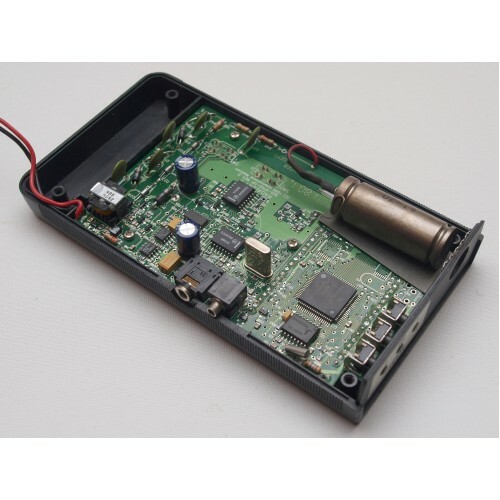 Very few instruments have this sort of range and capability; fewer still combine it with a pocket-sized case, large LCD auto ranging display, audible alarm/alert, audio and data output ports, audio and visual 'event' indicators and a long battery life: we don't expect them to be available for very long at this price! 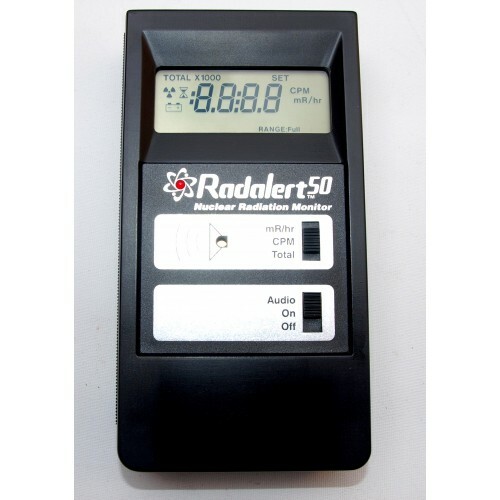 The Radalert 50 is exceptionally easy to use. There are just two controls on the front panel; one switch is for turning it on and enabling the internal sounder, the other is for switching between measurement units (CPM – counts per minute or mR/hr – milli Roentgens per hour). At switch-on the readout accumulates for the first minute and automatically refreshed thereafter at one-minute intervals. 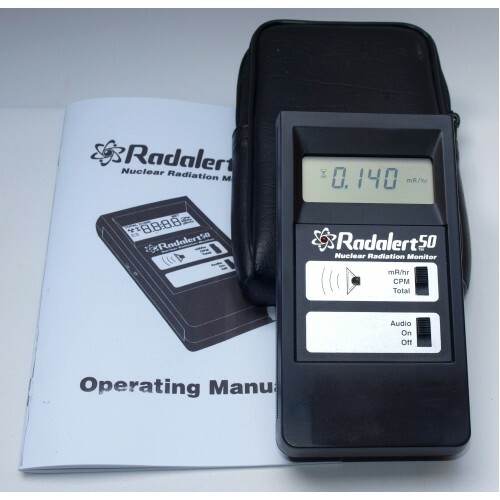 This gives a very simple and easy to understand indication of radiation levels, making it suitable for both personal monitoring and protection as well as long-term environmental logging. 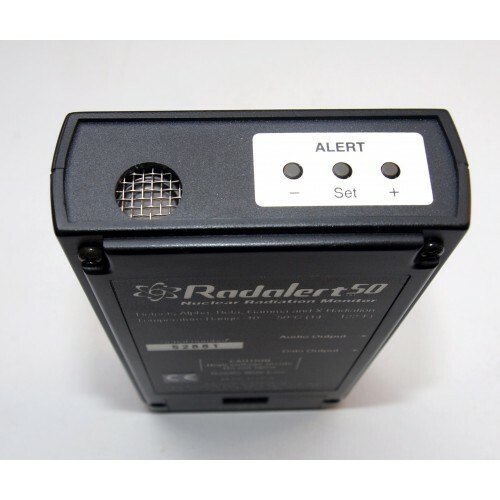 On the top panel, next to the opening for the Geiger tube’s end-window (protected by a metal grille), there are three more simple controls for enabling and setting the Radalert 50’s ‘Alert’ function, which sounds when the detected level exceeds a user-set threshold. An on-screen indicator shows it is in the Alert mode. 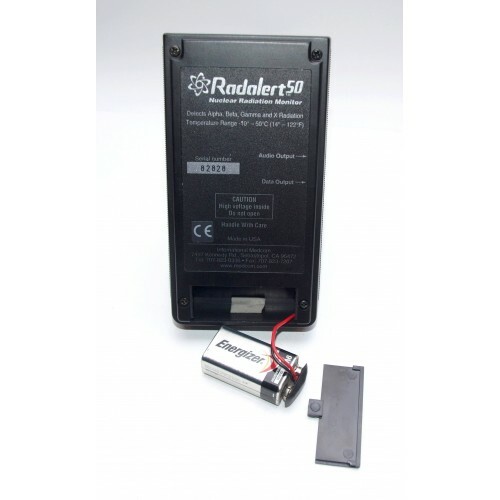 Our Radalert 50s are pre-owned but have seen very little use and are in near-mint condition. Needless to say they are in full working order and well within factory specs. All of the important numbers you need are below but if you want to know more about this highly regarded instrument there’s plenty of detailed info on the web. As an added bonus it also comes with a custom carry case and a copy of the operating manual. Sidewall: 0.3mm #446 stainless steel. The prices shown are for UK buyers and inclusive of Royal Mail's Special Delivery Service. Non-UK buyers: item will be sent via insured tracked/signed airmail. Prices will be added during the check-out process. Please also note that this item may be prohibited or restricted in some countries.